At the Spring Valley Senior Living and Health Care Campus, residents inspire us as much as we inspire them. When you’re part of our team, you have all the support and resources you need to focus on residents and your career goals. Explore a career with us today! 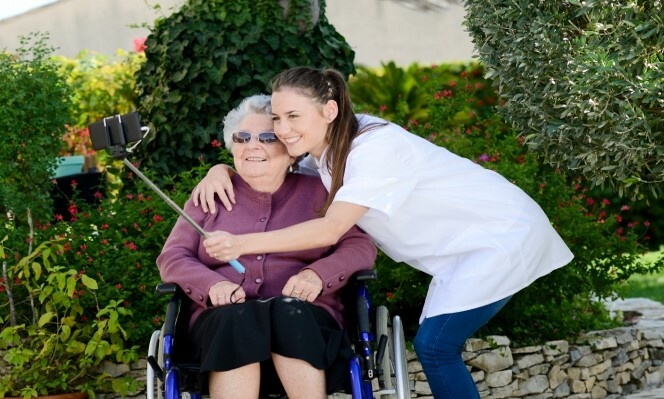 The Spring Valley Senior Living and Health Care Campus rewards our team members with competitive salaries, a full selection of benefits including paid time off, paid holidays, flexible scheduling, and more. Please complete BOTH the employment application and background information disclosure to apply and send as an email attachment* to: marketing@svhcs.org. *Please do NOT use the “Submit Form” button at the top of the PDF. For more information about available positions or the application process, please contact us. Please click on each position for more information. Registered Nurse (RN) – Part Time and Full Time – $1,000 Sign – On Bonus! I have always enjoyed my job at the nursing home. People have asked me if I don’t get tired of the same job, doing the same thing over and over but I tell them every day is a new day and new experience. No two days are ever the same, and at the end of the day when I leave I feel I did the best job I could to make my residents days complete. With all of the up’s and down’s through out the years I am so glad I applied here! 4 year anniversary of working here-thanks you guys for being awesome co-workers! I am very thankful to have had a wonderful work experience here at Spring Valley Health and Rehab. I sincerely appreciate the job opportunity that was given to me as a teenager in high school. In addition allowing me to continue to move up the chain, and allowing me to start my nursing career here. Without it I would not be able to be where I am today. The nurses, aides, and other staff have been nothing but wonderful to me inside and outside of work. They are all very devoted to caring for others, and it is seen in their work. They have set the standard for me in what it means to be a good nurse, aide, and caregiver to my patients. I am incredibly thankful for the past three and a half years I have spent working here, I could never ask for a better team.